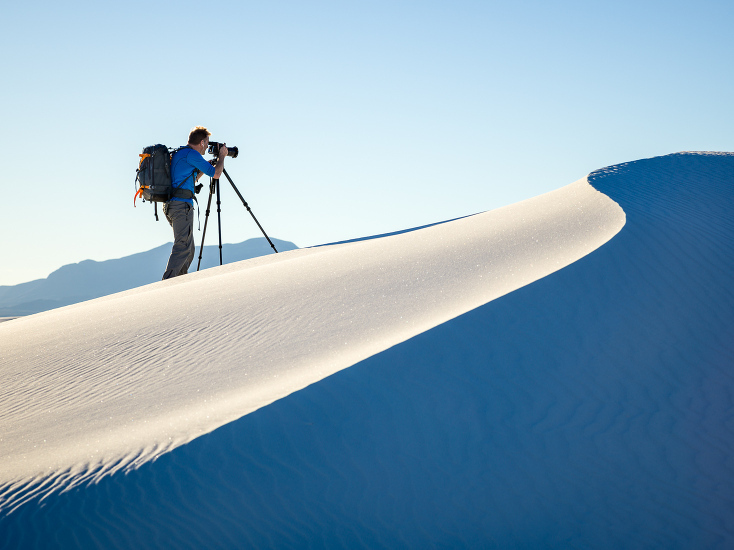 Each year I teach several workshops and give a few seminars on a variety of topics including adventure photography, digital workflow and artificial lighting. Below is a list of the upcoming workshops I will be teaching and seminars I will be giving. As you scroll down you can read descriptions about each of these workshops and find out how to register for each one. If you are interested in a private workshop please contact me and we can discuss options and pricing. I hope to see you out there in the field this year. “Your workshop at Santa Fe was too good and I came away with a lot of knowledge and renewed energy. The level of expertise that you and Michael shared was top-notch and I hope to repeat this experience again. Thanks for such a great workshop!” – Participant in the 2008 Balloon Fiesta workshop taught by Andy Biggs and myself. “My mind is still spinning and I can’t help but smile every time I think of the wonderful experience garnered from our workshop. Between what I learned from the two of you, as well as from my talented classmates – this was a great experience, and I would do it again.” – Participant in the 2008 Balloon Fiesta workshop taught by Andy Biggs and myself. After a few years off, the Surfing Photography Workshop is back and is slated for February 2019. This workshop has been so popular over the last several years that we are putting it on again. This workshop is by far one of the best workshops I have ever been a part of. In fact it is so much fun, we have had several people take it twice and a few of them even want to take it again in 2019. I have never had anyone take any of my other workshops more than once so that gives you some idea of the great time we have in this Surfing Photography Workshop. Join legendary surfing photographer Brian Bielmann and adventure sports photographer Michael Clark for an exciting one-of-a-kind workshop that delves into the world of surfing photography. Brian is a top surfing photographer who has been shooting the sport for more than 40 years. Michael brings his adventure photography skills and knowledge as well as his in-depth experience with digital workflow to round out the workshop. This 4-day workshop combines daily photo shoots at world-class surfing locations, lifestyle photo shoots and classroom instruction. We will be spending half of our time shooting in the early mornings and in the late afternoon and evenings when the waves and the light are at their best. The other half of our time will be spent in the classroom. All of the classroom instruction will be centered around image critiques, discussions on gear, strategies and the business of photography as well as in-depth discussions on shooting surfing. We’ll also cover digital workflow in detail using Adobe Photoshop Lightroom and Photoshop. The workshop is scheduled during a period where large waves hit the north shore frequently. Though we cannot predict or guarantee the wave size or surfing conditions, the north shore of Oahu serves up sizable waves regularly. Depending on the waves, we will choose the best locations for shooting and we will also schedule lifestyle shoots that help to fill out our coverage of the world of surfing. A deposit of $700 is required to secure your spot in the workshop. Final balance will be due no later than January 15, 2019. Enrollment for the workshop will be limited to ten people maximum. We are limiting enrollment this year to make sure we can give our full attention to a smaller group. The cost of the workshop does not include travel expenses, hotels, transportation or meals. Those expenses are in addition to the cost of the workshop. We will provide an opening night get together and one group meal as part of the workshop. Go to my blog to read the workshop announcement with more information on this workshop. To register for this workshop please send me an email and I can send the registration form along with a payment request for the $700 deposit. How do you separate your work from the pack? Do you want to break down the barriers that are keeping your photography from standing out? In the last five years, flash manufacturers have added some incredible technology to their latest strobes. Michael has been working with these new flash technologies for over seven years and has helped a few companies perfect the technology. High Speed Sync and Hi-Sync (HS) allow us to freeze action like never before, light subjects from ridiculous distances and easily create lit portraits with incredibly shallow depth of field. In short, we can create images that were never possible before. Designed for intermediate to experienced photographers, this 5-day workshop concentrates on creating unique images using cutting edge lighting technology. Working with elite athletes, dancers and models both in the studio and out on location, we aim to create images that are not easy to duplicate. Topics covered during the week include high speed sync flash techniques, multiple exposure flash techniques, freezing motion, stroboscopic lighting, advanced portrait lighting, motion blur and rear curtain strobe techniques, and mixing continuous lighting with strobes. For more information and to register for this workshop visit the www.santafeworkshops.com. Action and Adventure Junkies Rejoice! Set out on a photography journey in the Grand Tetons with our faculty of adventure photographers and editors from National Geographic, Red Bull, The North Face, and more. Work with the expert photographers and learn the shooting and scouting techniques that they use to land their images in top publications, meet the editors behind some of the world’s most daring photography expeditions and learn how they hire photographers, and even spend a night camping with the faculty as you network with them throughout the workshop. Instructors: Dave Black, Sadie Quarrier, Lucas Gilman, Jen Edney, Bo Bridges, Ryan Taylor, Scott Wilson, Ron Taniwaki and Michael Clark. For more information and to register for this workshop visit the Summit Workshops website.